Yet another utterly pointless trip just aimed at giving Camilla some positive coverage. do they pay him for this? Yes they do and handsomely I've no doubt. Throw in endless travel, full expense account and visits to some amazing places that the common herd can't access and he, like the rest of them is prepared to spout endless BS to keep him riding the gravy train. I think Camila wants whatever Diana had. Now she's a fashion icon. What a pathetic joke. The Duchess of Cornwall's arrived at the Louvre for a private tour taking in the Mona Lisa. The museum's closed to the public on Tuesdays. Ah yes so I suppose Cams will dazzle everyone with her beauty and outshine the Mona Lisa itself. The DM has an article with pictures where she is scarfing down food. ICK. Have Dior launched a new equestrian range for horses? Camilla's wardrobe is done by Oldfield no? It's awful and it makes her look fat and without any figure. This PR onslaught is never ending. Her ninnies are too low, and one is longer than the other, her hair is like a bad marxx brother's movie character. People who to see are curious.. nothing more. Anyone who falls for this BullCrap is naive to say the least. I know people who have been around her, she is not the down the earth friendly type.. far from it. Why would her first solo overseas trip be to Paris of all places? All paid for by Chuck. These two make me sick. Chuck is weak and easily manipulated to allow this. Camzilla's current illusion is that she is the incarnation of Catherine Parr. What she really is is a ruthless manipulating wh*re. She has taken over everything that was rightfully Diana's: her husband, sons, position and possibly her life. Now that she thinks she is this close to have her adulterous wrinkly head crowned she needs to revel in it one more by going to Paris as her first deed abroad. It was a confident decision and it paid off. The Duchess of Cornwall could have chosen other cities for her first solo overseas tour, but she chose Paris, a city closely -- and tragically -- associated with Diana, the first wife of Prince Charles. But Camilla came here despite that, not because of it. This is more about Camilla's long-term rehabilitation from being "the other woman" to queen-in-waiting and the strategy is working. Diana may have been a fashion icon who famously championed Dior handbags, but Camilla didn't shy away from accepting an invitation to Dior in Paris in her own right. A Clarence House spokeswoman told me the duchess was, "delighted to accept as she was keen to highlight the wonderful skill and craftsmanship involved in this renowned french fashion house." And I saw her clearly fascinated by the intricacy of the work being done in the couture workshop on the top floor. 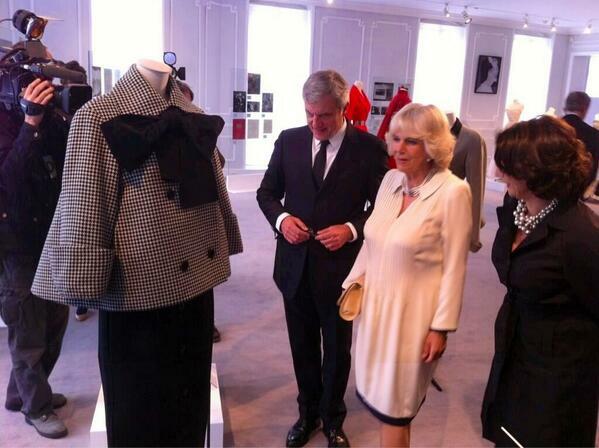 Camilla, unlike Diana, isn't defined particularly by fashion. She's more about country living and was in her element watching an equine display by the Republican Guard in Paris. She went behind the scenes to meet the horses and speak to the farrier making their shoes. She's a hands-on duchess, unafraid of getting her hands dirty. She's as comfortable with a farrier as she is with presidents and prime ministers. She is something of a social chameleon, able to move between easily different groups with ease, including the press pack. In a typical Camilla moment, she arrived Paris with a smile and greeted the media with a big hello, then went on to admit nerves. Camilla's common touch came out during an unannounced visit to a street market. A butcher asked her to try a sample. She of course obliged and he was struck about how nice she was: "Very agreeable, bearing in mind her status," he told me. At another stall, she bought five dresses for a grand-daughters from a trader who described the duchess as polite and said she "loved everything. She was very respectful." A royal source in the past described to me how the duchess is a "professional grandmother." There's more to the Duchess of Cornwall than you see: invariably she manages to win people round when she comes face to face with them, despite the Diana back-story we all know so well. We will be getting more insight into her character as she takes on more official duties. The queen is cutting back on her travel and Prince Charles with Camilla are increasingly being asked to represent the monarchy, which will one day be theirs. We're being given in a sense Camilla, queen-in-waiting, not just Prince Charles's wife. Gosh. I believe Camilla should have solo jobs, anything that would make her work more is ok from my part. But she even went to Dior. And the whole trip was silly. Not even the speech was something to talk about and the first one in eight years...? Interesting that they had to remark that the trip was paid by Charles. That means that this trip is in the same level as Bea&Eugenie's trip to Germany! The next queen consort first trip to a foreign country is not even in a real official capacity, because if it was Charles wouldn't pay for it. Then it also means that they know that Camilla is still not accepted, Charles wouldn't be paying for a PR trip to France. It is like trying to sell someone a weed and telling them it is really a rose. Just think, Charles whined about how much Diana cost; but go figure, a woman who has cost him millions in terms of PR is buying at Dior and Oldfield, but Charles has no problems. What a nasty little hypocrite the both of them are.